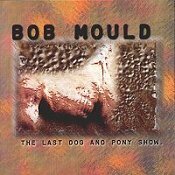 THE LAST DOG AND PONY SHOW marks the last time Bob Mould will ever hit the road in support of an album with an electric band. "I've been doing this (electric band touring) for the better part of 19 years, and I'd like to move toward something that doesn't disrupt my attempt at having a life, separate from my career, for chunks of 4 months of time," states Mould on the bio sheet. The beginning of what could be another side of Mould, or, depending on how you look at it, the end of a strong career. THE LAST DOG AND PONY SHOW may mark the last rock record we find Mould releasing, but as he departs, the Husker Du great leaves us with some bright memories. "Moving Trucks" drives through power-pop terrain with ease. With his heart and mind deep in the song, the hooks are as sweetly sharp as ever. The drums thunder through the song with such emphasis on feeling, and the bass grooves with such spirit, that the rhythm section has no problem convincing you this song is a winner. Carried on the heels of the punchy guitar riffs, the lyrics ripen as the song progresses. Starting off a bit vague, the speaker opens up a bit as the song progresses. Poetic, the words are still written with the everyday man in mind -- easily understood, and translatable by anyone who feels the song. And with Mould's voice empathetic one moment and then optimistic the next, you'll be feeling the words. "Classifieds" is another album standout. Melodic, crunchy, and embracing every hook the song produces, the song will have you bouncing like no other. One minute the drums will be merely keeping time, then they'll step out from behind the song and take the spotlight with some spitfire beats and cymbal heavy, hypnotizing adventures. The bass doesn't make a scene, but it does make its presence known. Going off like a ticking clock, it hides behind the drums and guitar, but does it's job nicely (helping to thicken up the sound). Then there is Mould and his guitar, which work hand in hand to make the song accelerate to the point it does. Leading the way with his voice, he helps push himself to the max with his own hooks. "Reflect The Pool" shows Mould at his best with some post-punk, power-pop to make any Husker Du fan turn their head in excitement. Complete with ample amounts of infectious pop, Mould turns up the heat a bit while the engines begin to road. As the rocket-fuel pumps into the engine, the motor's gears turn and propel the song into a massive assault of guitars, drums, and bass. With numbers like these, you'll be crying at the thought of the rock world losing Bob Mould. But, in this day of technology, you can simply hit your repeat button and listen to it over and over again. Just don't think bad thoughts (like Mould won't be doing this again). But the whole album isn't as bright as these tracks. "New #1," the opening track, seems like an empty-hearted attempt to do one last rocker before hanging up the electric guitars for a gentler life. An acoustic guitar leads the song as Mould tries to carry you through an energetic jungle to start the disc off in the right mood, but it just doesn't work. Neither does "Taking Everything." Amplified and definitely a proud bi-product of rock, it's clean, flawless nature seems too contrived for radio. You could play this one next to other 'alternative' radio hit songs and the comparisons would be wide open. Bob just seems to be giving up at this point, trying to muster up enough energy to complete one last attempt to give his fans what they want. Good thing there are only a few tracks on this disc that just don't make the cut. Otherwise, the album is a pretty exciting, vigorous album that shows Mould going out while he's still got something left in him. Going out on top (and not producing a whole album worth of "New #1") was probably a wise choice. But, I won't be admitting that ever again. I'll be with you all trying to convince him to get back on the road and let his inner child rock out. History in the making, this album has enough drive to live up to that title. I'll give it an A-.